Australia will host a new round of trade talks with Britain with an eye to boosting exports, worth $12.6 billion, as Prime Minister Malcolm Turnbull heads to London next week to build momentum for a deal. British officials will fly to Canberra within days for a “working group” on the free trade agreement, amid hopes on both sides that a deal will commence as soon as Britain leaves the European Union at the end of 2020. Trade Minister Steve Ciobo hit back at fears of a flood of foreign workers under the deal with the United Kingdom in the wake of similar concerns about labour market testing under a free trade agreement with China three years ago. 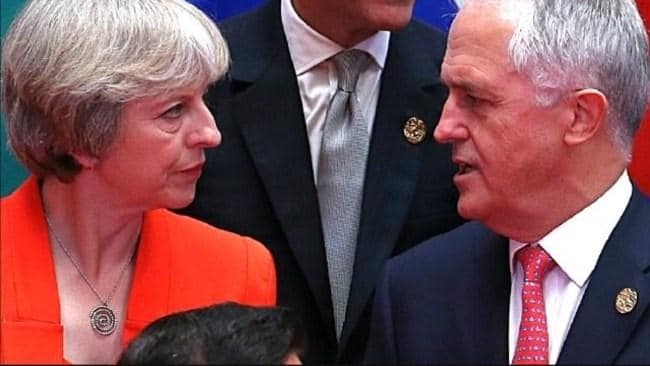 Malcolm Turnbull with British PM Theresa May outside Number 10 Downing Street in London last year. Australian exports to the UK were worth $12.6 billion and the trade in services is one of the strongest areas of growth, but this has raised expectations that the flow of workers across borders will be a key issue once the formal negotiations begin. Mr Ciobo warned against a revival of the “scare” over labour market testing in free trade agreements at a time when the terms of a UK deal were yet to be finalised. “Those scare campaigns are disgraceful because they deliberately misrepresent the impact of FTAs on our ability to regulate foreign workers,” he told Fairfax Media. “The fact is that we retain all the rights to regulate foreign workers, with or without an FTA. The ACTU is warning about the risk to Australian jobs from “carve outs” in free trade agreements, saying government guidelines show that labour market testing is only mandatory unless an international obligation applies. The Australian Fair Trade and Investment Network says the Trans Pacific Partnership will allow workers from six more countries into Australia without employers having to check that a local worker could do the job. Mr Ciobo rejected the warnings about foreign workers and said the primary focus in the trade deals was on “intra-corporate transferees” - usually executives who shifted within one company across multiple markets. “Where agreements deal with foreign workers, they have no impact on unskilled or low-skilled workers. We retain all of the safeguards that we have always had with regard to unskilled and low-skilled workers,” Mr Ciobo said. The likely upside for Australia in the deal will be greater agricultural exports, such as enabling Australian winemakers to replace their European rivals in a big market. Mr Turnbull will fly to London next week for meetings with his counterpart Theresa May on the sidelines of the Commonwealth Heads of Government Meeting, setting up an opportunity to discuss a trade deal. The formal negotiations with Britain can only begin after Brexit is triggered in March 2019 but Australia has more than 18 months to finalise the terms during the transition period before the UK departs the EU at the end of December 2020. The working group discussion in Canberra in the middle of this month is the third meeting of its kind to clear the ground for the deal, although the UK is prevented under EU rules from starting formal negotiations at this stage. Mr Ciobo said his meeting with the UK Secretary of State for International Trade, Liam Fox, in London last month gave cause for confidence about getting an agreement soon after Brexit. “What matters is that we get a good quality, comprehensive deal. I’ve had really cordial discussions with Secretary Fox and I think we share ambitions in terms of the scope as well as the time frames,” he said. Australia must wait for Britain and the EU to finalise the terms of their split before the terms of any bilateral agreement can be negotiated.